It’s weird how one decision can have such a tremendous impact on your life. Choosing Rider — and getting involved in research — was monumental to my career. With impressive GPA and SAT scores, Imani was placed in Rider’s Freshman Science Honors Program where she learned about faculty research projects. That spring, she began working with Dr. Daniel Druckenbrod studying the impact of acid rain on East Coast forests in response to climate change. Over the next four years, she traveled to Virginia and West Virginia while doing field work. She also worked with Dr. Reed Schwimmer, using a scanning electron microscope to determine the source of garnets found along the New Jersey coast. As a McNair Scholar, Imani was encouraged to participate in research and present at conferences. She presented research on Dr. Druckenbrod’s project at three different conferences, including the national McNair/SSS Scholars Research Conference in Atlanta. 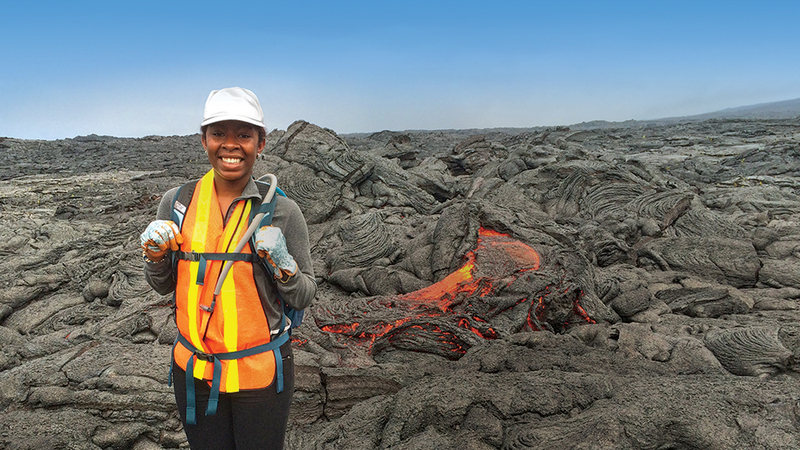 Imani became interested in volcanoes after taking a Petrology class at Rider. In 2017, she was one of 10 students selected from 500 applicants for the Research Experience for Undergraduates (REU) sponsored by the National Science Foundation. That led to a paid summer internship with the University of Hawaii working with some of the world’s top volcanologists. She collected foreign rock (xenoliths) from the Salt Lake Crater on the island of Oahu to study the thermal history of the upper mantle. Imani also visited the Big Island where she walked on Kilauea’s active flows. “I was right on top of the volcano! It was extremely hot and so cool to witness how land is made,” she says. “That trip along with the research confirmed that this was the field for me. For a prospective graduate student and future geologist, the experience was invaluable,” adds Imani, who was invited to return the following summer as a research assistant to help wrap up the project. The number of years Imani worked as an undergraduate research assistant analyzing tree rings with Dr. Daniel Druckenbrod. She also worked with Dr. Reed Schwimmer studying the geochemistry of garnets. Her Rider research experience helped her to land a highly competitive summer internship working alongside the world’s top volcanologists in Hawaii — and a return gig the next summer as a research assistant on the same project examining xenoliths. In January 2018, Imani took part in a 10-day Nature’s Business study trip to the Galapagos Islands off Ecuador where her group examined the various aspects of tourism and its impact on the island. “My trip to the Galapagos Islands was an amazing and eye-opening experience. I learned about evolution and natural selection,” she says. Imani held three jobs on campus during her four years at Rider. In addition to her work as an undergraduate research assistant, she also worked two years as a tour guide for the Admissions Office and as a lab assistant/tutor working for Dr. Hongbing Sun in the GEMS department. I’m where I am now because of the great education, research and field experiences I had at Rider. That early research I did had a domino effect, leading to more research opportunities at Rider and in Hawaii and helping me get into one of the nation’s top-ranked programs.